The maddening disconnect in politics goes on, as politicians who just two months ago slashed taxes are demanding more money for the increasingly unstable and dangerous Hanford nuclear-waste cleanup. Probably no place in America shows more acutely how incoherent politics has become than our own Hanford nuclear reservation. • Then on cue, in December, plutonium particles again contaminated dozens of workers and cars because of shoddy demolition work at a defunct bomb factory. • Then the federal government put out the most eye-popping cost revision I’ve ever seen. It found that the cost of cleaning up tanks of old radioactive waste — the most serious pollution problem at Hanford — will now run to $111 billion, an extraordinary $61 billion more than predicted just three years earlier. • Then on Monday the president’s budget recommended … slashing Hanford cleanup spending by 10 percent. “It’s a big disconnect with reality, probably as big I’ve seen,” says Tom Carpenter, of the watchdog group Hanford Challenge. Check out the local congressman for the Tri-Cities, Rep. Dan Newhouse, R-Sunnyside. He made headlines Tuesday by vowing to fight to save the Hanford cleanup money: “Now is not the time to jeopardize worker safety or impede this vital cleanup,” he said. But just last week, he cited rising deficits as an argument against more spending. Worse, in December, when the Hanford cost estimates were exploding and the cleanup melting down, Newhouse voted to cut federal taxes by $1.5 trillion. Congressman: You don’t get to slash taxes, decry the deficits and demand big spending, all in the same political sentence! The truth is, though, he does get to do this. It’s the norm. This is what I mean by our politics becoming incoherent. Anything goes, no matter how hypocritical, math-defying or nonsensical. Carpenter, who has watchdogged the Hanford project for 32 years, says the cleanup now is in a dangerous phase. Highly radioactive wastes are being stirred up and moved, but it’s happening in an unrealistic budget environment that almost guarantees corner-cutting. The plutonium release in December, and one earlier in June, are cases in point. 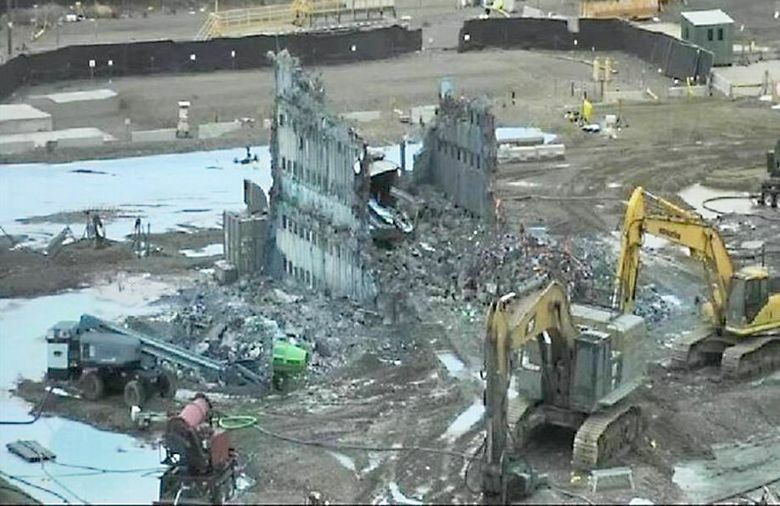 Workers were demolishing a plant that once made the plutonium “pucks” for much of the U.S. nuclear bombs arsenal. Plutonium dust escaped, contaminating a number of workers (including several dozen who are known to have inhaled plutonium into their lungs.) Some were even driving around town with plutonium on their cars, a “serious loss of control” at the now-shut-down site, according to state regulators. Obviously money isn’t the only hang-up in a project that has churned through billions already. The Hanford cleanup has seen it all, from mission creep to waste and incompetence to multimillion dollar settlements stemming from allegations of contractor fraud. But Carpenter says the main issue is the federal government has never taken it seriously enough. With nuclear waste, it’s go big, or continue to go mediocre. Major catastrophe apparently means something worse than dozens of workers getting exposed to plutonium. The whole mess is like a metaphor for how the entire federal government is run today. There is talk about big needs, even as they cut taxes on corporations and the wealthy, making it harder to address those needs. We the people are distracted by our borrowed bonuses. The crippling disconnect from reality isn’t even acknowledged. The reason I’m harping on this is that the something-for-nothing mentality that pervades national politics has consequences. In this case, the stakes are both very high, and right in our backyard. I find it maddening, and I don’t even have plutonium particles lodged in my lung because of it.